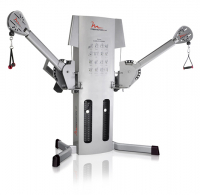 INDEPENDENTLY ROTATING ARMS › Each arm rotates vertically in 12 settings and horizontally in 9 settings to accommodate virtually any movement pattern. Arms are counterbalanced for easy positioning. SWIVEL PULLEYS › Pulley design ensures uid cable travel and provides nearly unlimited range of motion. CABLE TRAVEL › Extensive cable travel allows for full exercise range of motion. Single arm: 89 inches (218 cm). Two arms: 89 inches (218 cm). WEIGHT STACKS › Two weight stacks of 210 pounds each are independent, allowing two people to work out at the same time. Innovative 3-to-1 cable ratio provides extensive cable travel and smooth resistance when performing high speed movements. INDUSTRIAL CONSTRUCTION › Designed after the commercial FreeMotion Dual Cable Cross, this machine is constructed from 7- and 11-gauge steel tubing and is electrostatically powder-coated. ANKLE CUFF › For lower-body exercises, the included ankle cuff is padded with velcro for comfortable, secure placement. Contoured Platform-Unique platform design enables users to maintain correct ankle alignment and is textured to ensure stable foot placement. Shoulder Pads-Contoured shoulder pads swivel and slide to comfortably fit a wide variety of users. 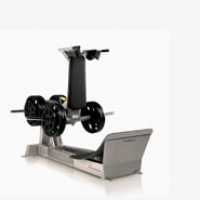 Low Plate Load Design-Weight plate storage bars are positioned near the load arms so users do not need to lift plates higher than waist level. Safety Stop-Users set the lowest point in squat motion by placing a solid steel locking bar in one of seven positions. 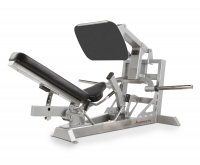 The FreeMotion Plate Loaded Leg Press targets and strengthens your upper legs for explosive power in every day activities. The foot platform features textured, non-skip Line-X® coating for stable foot positioning throughout your sets. 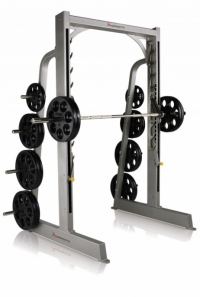 Walk-through Design- Elimination of crossbar allows easy walk-in/workout access and facilitates placing a bench under the bar for multiple exercises. Safety Stops-Ratchet into place prior to lifting and use pop-pin adjustment to lower for quick positioning. Shielded Construction-Cables, linear shafting and safety stop are shielded for safer usability.